O.J. : Did he deserve parole? Yes, Simpson earned parole “like any other well-behaved, 70-year-old convict,” said Jeffrey Toobin in NewYorker.com. But like so many other people who followed his murder trial, “I see the bloodied corpses of Nicole Simpson and Ron Goldman” whenever I see his “Who, me?” grin. 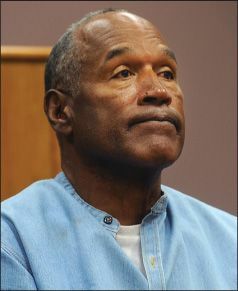 “Simpson belongs in prison, and he should remain there.” In his statement to the parole board, O.J. sure didn’t sound sorry for anything he’s done, said Eric Deggans in NPR.org. He insisted he had a right to take back his trophies, and said, astonishingly, “I’ve basically spent a conflict-free life.” This, from a powerful athlete who repeatedly battered his wife and left her hospitalized in 1989, when he pled no contest to spousal battery. Later, Nicole and Goldman were so savagely murdered that their heads were nearly severed by a killer with a knife. It feels as if Simpson “is the thorn America will never quite extract from its side”— proof of our tangled relationship with celebrity, wealth, media, criminal justice, and race.